Strada Statale Romea was opened in the 1950s to facilitate communication between Ravenna and Venice. It was named after a medieval itinerary followed by pilgrims on their way to Rome. Via Popilia, the ancient Roman road which crossed the region was situated a few miles to the west of Strada Romea and today's town of Codigoro was a post station along that road. Strada Romea allows easy access to the Abbey of Pomposa, but reaching it from Codigoro by foot or by bicycle allows the traveller to acquaint himself with its surroundings. 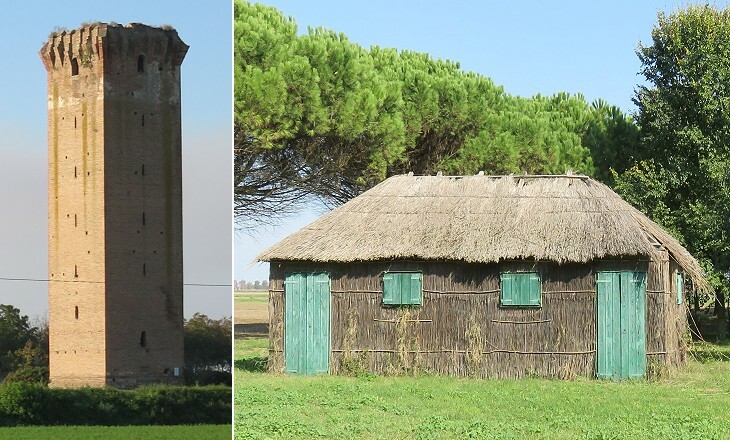 The area has undergone major changes from the Roman period to the foundation of the Abbey in the IXth century, to the development of marshes after the XIIIth century and to their reclamation in the late XIXth century. The lagoons are again subdivided, though in less marked fashion, by long strings of narrow islands, some of bare earth and some covered with rough grass, never more than two feet above the water, and not many feet wide, but extending often for miles in length. The low black lines of these argini, as they are called, alone break the monotony of the lake; and a few huts rising upon them, at intervals of many miles, serve as the only landmarks within the wide boundaries of the green, encircling shores. George Macaulay Trevelyan - Garibaldi's Defence of the Roman Republic - 1910. 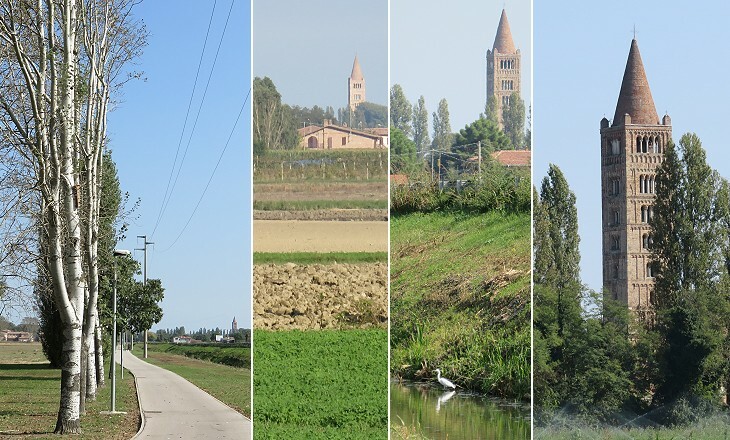 The description refers to the year 1849 and to the marshes of Comacchio between Pomposa and Ravenna, but it fits the landscape which surrounded the Abbey as well. 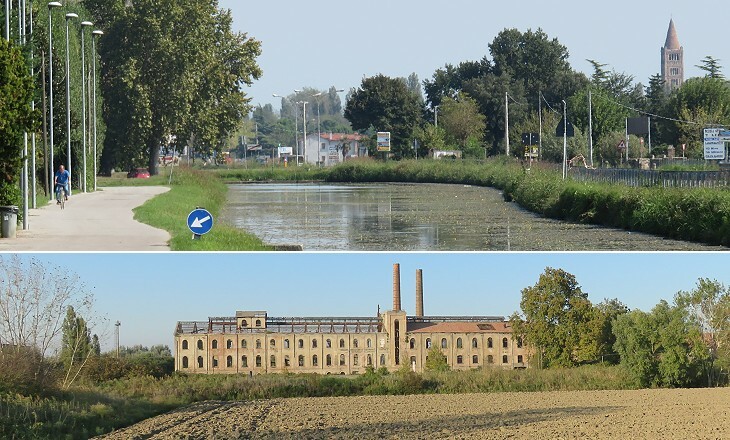 The reclamation of the marshes was strictly linked to sugar beet production and processing and a very large sugar refinery was established at Codigoro. This monoculture has now been replaced by a variety of crops. When the Abbey was founded it was situated on an islet formed by two branches of the River Po before they emptied into the Adriatic Sea. In 1152 a major flood modified northwards the route of the river; in the long run this change had a negative impact on Pomposa which was gradually surrounded by marshes and became more distant from the coastline. The pages of this section on Roman Aquileia, Pola and Trieste show the importance of towns and their inhabitants as holders of a significant portion of the wealth of the country and how this fact led to the construction of temples, theatres, amphitheatres, etc. The picture was completely different in IXth century Italy. 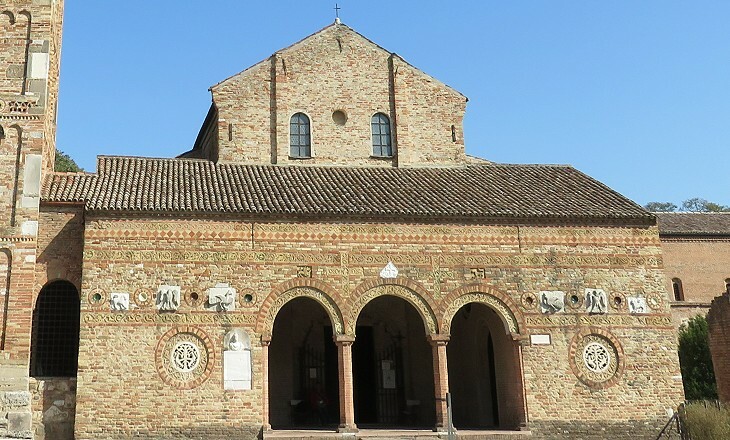 In a greatly impoverished economy, richness was concentrated in the castles of feudal lords and in a number of Benedictine abbeys such as Pomposa which received substantial donations (see pages on Subiaco and Farfa, two other important Benedictine abbeys). The wealth of these abbeys allowed them to assign some monks to copying books of prayers, but also some ancient texts. The decoration of the narthex has attracted the attention of art historians for its variety and its links with other buildings. 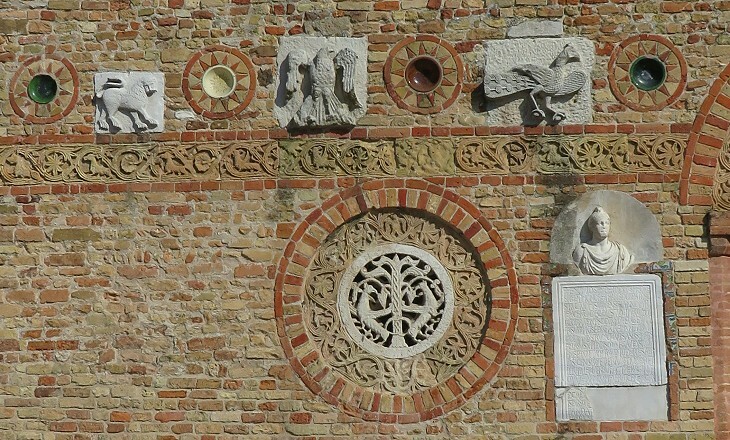 The use of pottery for decorative purposes is first seen here (it will become a characteristic of many Romanesque bell towers such as that of SS. Giovanni Paolo in Rome). The relief friezes recall those at St. Simeon's Martyrion and at Qalb Lozeh in Syria. The inscription seems an ancient Roman one, but it celebrates the improvements made to the church in 1015. 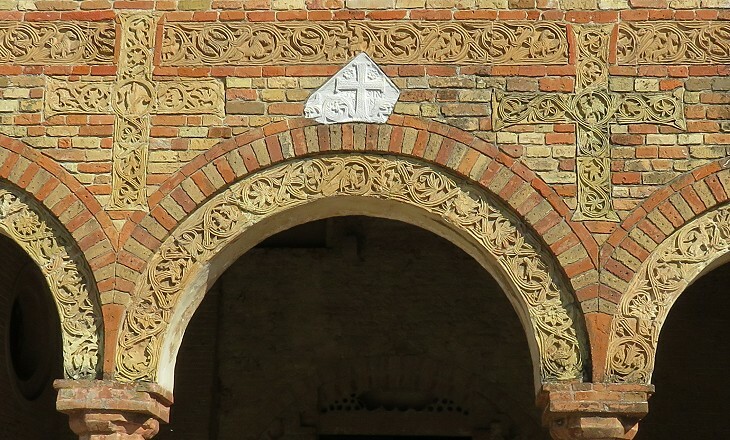 The use of bricks of slightly different tones as a decorative element was used by Marzulus, the master mason who designed the narthex, as a mean to enhance its architectural features. This approach was used in many Roman brickwork tombs along Via Appia Antica, such as that of Annia Regilla. 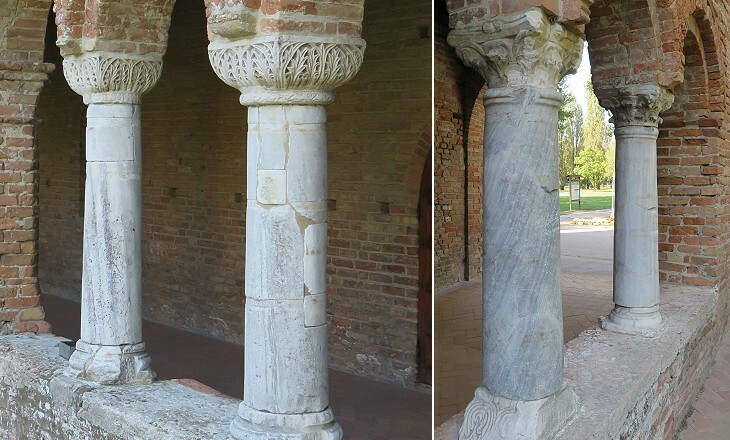 The glory of Pomposa is the splendid campanile which eclipses everything of that sort at Ravenna. It is supposed to have been built in 1063. Bell towers are the symbol of a trend of economic development in Italy and throughout Western Europe which marked the turn of the millennium. 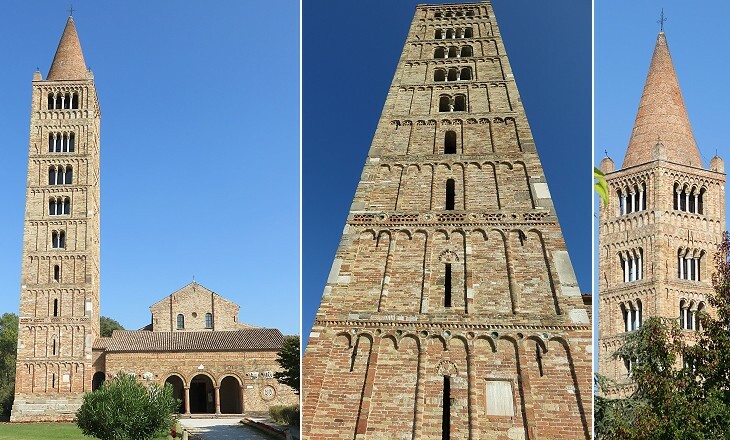 The bell tower of Pomposa was preceded by those of Aquileia and Torcello, but its design is much more elaborate and gives it a light appearance. The image used as background for this page shows some of the pottery dishes which decorate the bell tower. A large building stands opposite the church and the adjoining monastery. It was built at the same time as the narthex and its separateness indicates it was used for the non-religious aspects of the life of the Abbey. These involved the administration of the many properties of the Abbey and rendering justice on quarrels related to payments of rents, divisions of crops or estate borders. 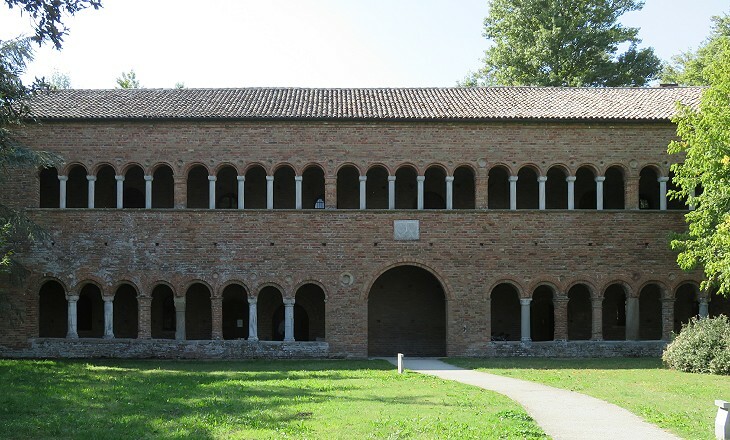 The Abbey owned Domus Dominicata at Codigoro, a building similar to Palazzo della Ragione which was used for the same purpose. A local chronicle of 1836 describes Palazzo della Ragione as a ruin. 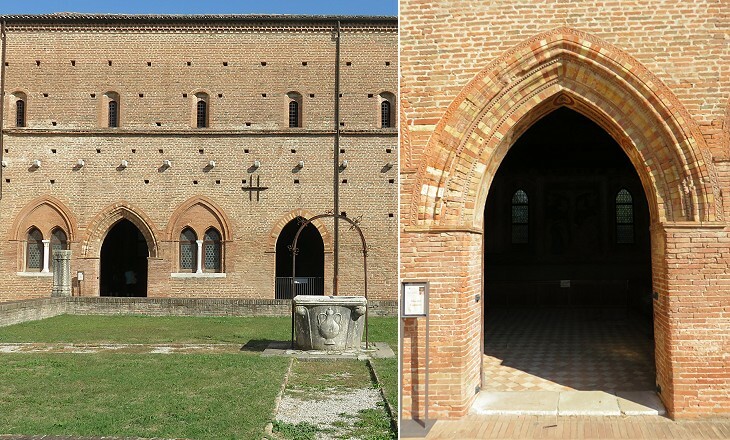 At that time all the buildings of the Abbey were part of a large estate belonging to the Guiccioli family of Ravenna. Lord Byron was the official lover of Countess Teresa Guiccioli in 1819-21 and he reports that Teresa suffered a miscarriage at Pomposa. It is possible that she chose this very isolated property of hers for a self-induced abortion. The Abbey and all its remaining premises were bought by the Italian State in the 1910s and Palazzo della Ragione was carefully restored in 1925-30. A number of the buildings of the Abbey are lost, including the library for which Pomposa was renowned. Guido d'Arezzo (991-1033) developed his method of musical notation (ut, re, mi, fa. sol and la) at Pomposa to help the monks properly learn and sing Gregorian chants. Parts of the monastery were redesigned in the XIIIth century in Gothic style.